Rumor alert! Gina Carano will face Sarah D'Alelio at Strikeforce: Overeem vs Werdum this June 18. Rumors are roaming around women’s MMA arena that Sarah D’Alelio will have a 145-pound brawl against Gina Carano at the upcoming Strikeforce: Overeem vs Werdum tournament. Prior to her upcoming match, Gina Carano was busy filming her role in the movie Haywire after a loss to Christiane “Cyborg” Santos last August 2009. 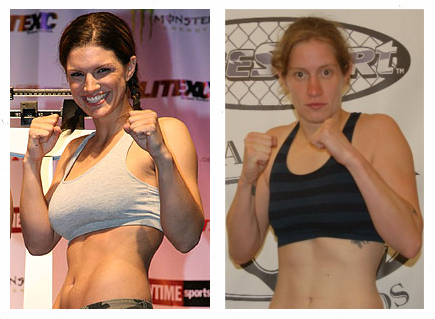 Strikeforce has been looking for an opponent to face her, and was in negotiation with Cinday Dandois. However, the latter was forced to turn down the offer due to pregnancy. Sarah D’Alelio, on the other hand, is coming from a unanimous decision loss to Julie Kedzie in a Jackson’s MMA series event last December. The Strikeforce: Overeem vs Werdum will take place at the American Airlines Center in Dallas, Texas on June 18. The event will green lit two remaining Heavyweight Grand Prix between Alistair Overeem vs Fabricio Werdum and Josh Barnett vs Brett Rogers.